Little Tokyo in Downtown Los Angeles is beautiful this time of the year. 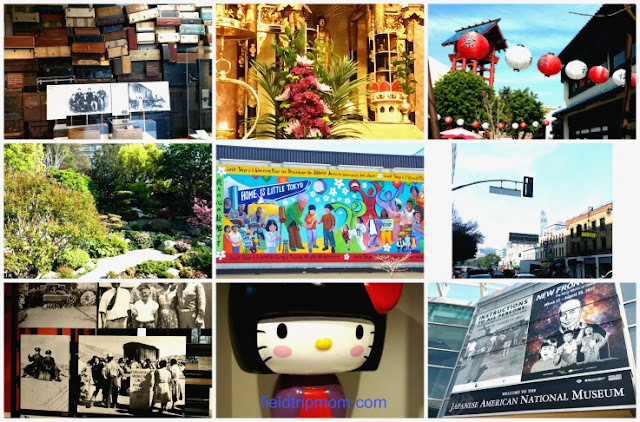 Recently, we headed to Little Tokyo for a fun family field-trip. Our first stop was exploring the Buddhist Temple on East Third Street. The docent, Nancy, really inspired us to be more compassionate and kind to one another. She was very articulate in delivering the message of Buddha and the Japanese Culture. The way she impacted us was through story telling of her life as a Japanese American. The entire experience was very humbling and eye-opening. I can honestly say that our entire family felt honored to meet Nancy and visit the temple. Next, we happily ran to the Japanese American National Museum after our visit to the Higashi Honganji Buddhist Temple. We were all excited to learn more about the culture after meeting Nancy. However, The visit to this museum was a slightly different experience. We all had knots in our throats when we left. Let me explain. The minute you walk in, you are hit with images of US Executive Order 9066. 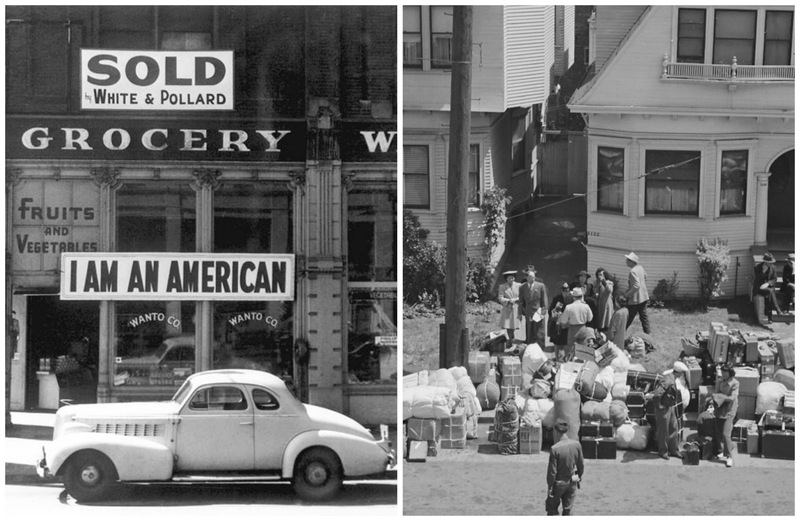 This order was a horrible thing that destroyed many Japanese-American lives. Dorothea Lange [Public domain], via Wikimedia Commons and WENDY MARUYAMA, AMERICAN (LA JUNTA, COLORADO, 1952 – ), ROHWER (THE TAG PROJECT) AND JEROME (THE TAG PROJECT), 2011, TEA- AND COFFEE-STAINED CUT PAPER, INK, STRING, THREAD, AND METAL, 144 INCHES X 24 INCHES, ARKANSAS ARTS CENTER FOUNDATION COLLECTION: GIFT OF THE ARTIST. I cried as we read with disbelief through the displays of Executive Order 9066. Reading history books and hearing about American history is not the same as being presented with evidence and photographs of American bigotry. 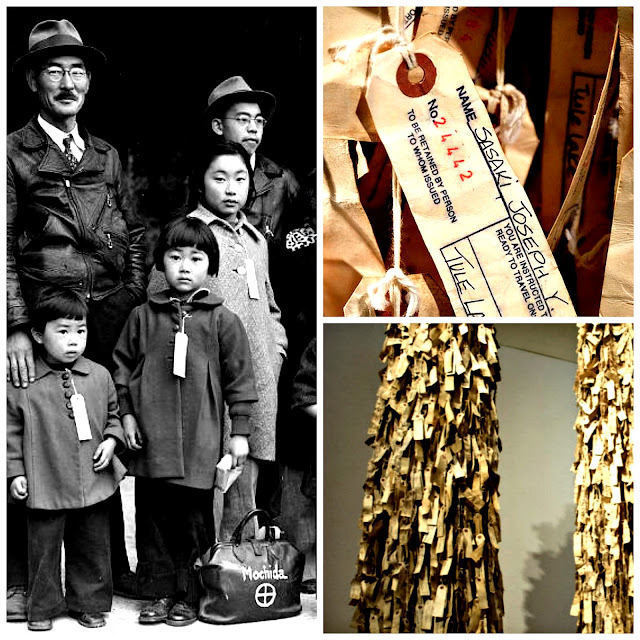 Standing next to a large display of Japanese American Tags was piercing. There were hundreds of tags hanging in a corner of the museum. These tags were used as part of the human accounting system for the concentration camps that President Franklin D. Roosevelt had built to enforce U.S. Executive Order 9066. Reading and living through the museum displays was heart-breaking. Looking at photographs of children being removed from their homes and placed into concentration camps just because of their ancestry. No crime had been committed, no trial or conviction had been established. It was unconstitutional and it happened right here in the US for the Japanese Americans of that era. These innocent people were imprisoned and lost everything for a war that the US didn't want to get involved in. Imagine today, being imprisoned for being a specific race, being separated from your family, losing your home and all of the possessions you have worked so hard to save for nothing more than to fight a war. Democracy and freedom are not protected by racism. Whether brown, black, white or any where in between, we are all immigrants to this fine Nation. The only true natives to this country are the American Tribal Nationals, remember this the next time you are tempted to say, "Go back to your county, you are not welcome here!" Let us all put down our "Arms" and be fast to wrap them around your neighbors regardless of the color of their skin. After our visit to the museum, we were all hungry and significantly sad. What to do? Therapy shopping. Just a few feet away is a great plaza filled with food and shopping. We found lots of great things that we could not leave behind. Around the corner from the plaza, we found the Japanese Cultural Center Garden. This beautiful sculpted garden was perfect to help us restore ourselves to peace and zen. Adorned with a trickling brook throughout the garden, this is a perfect spot to sit and enjoy tranquility, take some beautiful family photos or walk and admire all of the beautiful plants. Disclaimer: Not a sponsored post. All of our thoughts and opinions are all our own. Aquarium of the Pacific giveaway for Noche de Estrellas. 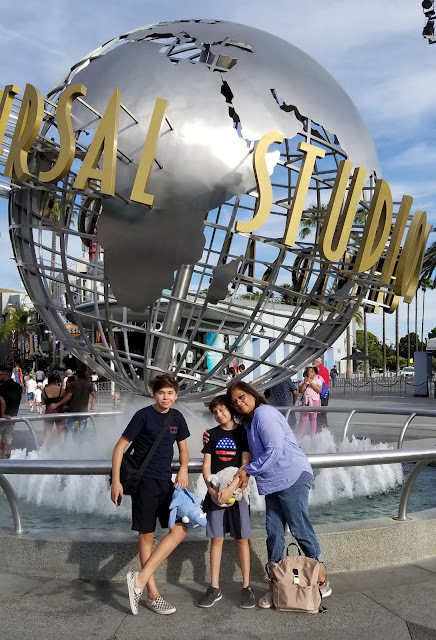 Aquarium of the Pacific is sponsoring a giveaway on Fieldtripmom.com. 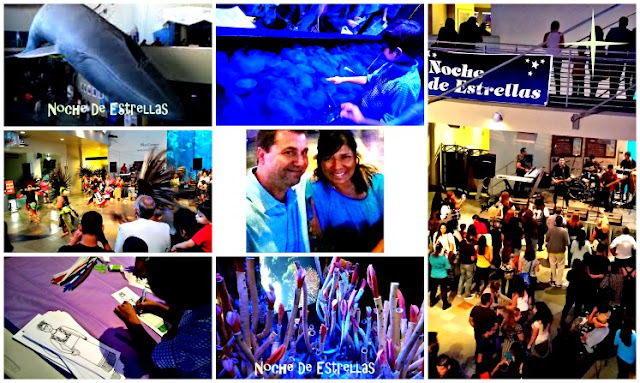 The giveaway is for (4) tickets to “Noche De Estrellas”. The Night of the Stars event offers live music and fun family activities. On March 24th, 2017 from 6:30pm until 10:30pm, the Aquarium will be filled with Latin music and sounds. DJ Quinto Sol, Sonsoles and Mayaztek will be performing as well as the Azteca Cultural Ketzaliztli. Children are invited to attend with their parents to dance Rumba, Salsa, Cumbias and the Cha-Cha. During the evening, there will be bilingual presentations with underwater divers, a treasure hunt with prizes, children's crafts, and other activities. Mexican food, beer, and beverages will be available for purchase for an additional fee. You can also travel the Pacific Ocean through the Aquarium exhibits to learn more about the more than 11,000 animals, including over 150 sharks that you can touch. Please note: The Australian Parakeet Forest will be closed. Aquarium of the Pacific is located 100 Aquarium Way, Long Beach, Ca 90802. Music: J Quinto Sol – 6:30 p.m.
Bilingual dive show with: Honda Blue Cave - 6:45 p.m. The cost of admission is $14.95 per person. Kids under 3 years are free. Enter for a chance to win (4) tickets to this fun event. Please only Southern California residents. Must be 18 years or older to enter. Remember that it's for March 24th, 2017 Noche de Estrellas event only. Good luck and hope to see you there!!! Disclaimer: This is a sponsored post. Aquarium of the Pacific is our sponsor. All thoughts and ideas are all my own. NO PURCHASE IS NECESSARY TO ENTER TO WIN. Prize is (4) tickets for Aquarium of the Pacific. These tickets are for the Noche de Estrellas event only to be claimed on 03/24/2017 The tickets will be at the front desk on the festival date from 6:30 p.m. to 9:30p.m. This family 4-pack to Noche de Estrellas, March 24, 2017, does not include food, beverages, gift shop purchases or applicable taxes. Giveaway starts 03/15/2017 and ends 03/22/2017. You must be a Southern California Resident, 18 years or older to enter. You must be able to claim prize by March 24, 2017. There are no substitutions or replacements. Lost or stolen tickets are the responsibility of the winner. There is no cash value. Entry is done through Twitter, Instagram and Facebook via Rafflecopter. Winners will picked at random through Rafflecopter. Privacy- all entry information is not shared with any third party. Field Trip Mom blog is not responsible for lost or stolen tickets. No Substitution or cash value replacements. Winner will be notified via social media and email. Aquarium of the Pacific is the sponsored of this giveaway. The tickets will be at the front desk on the festival date from 6:30 p.m. to 9:30p.m. 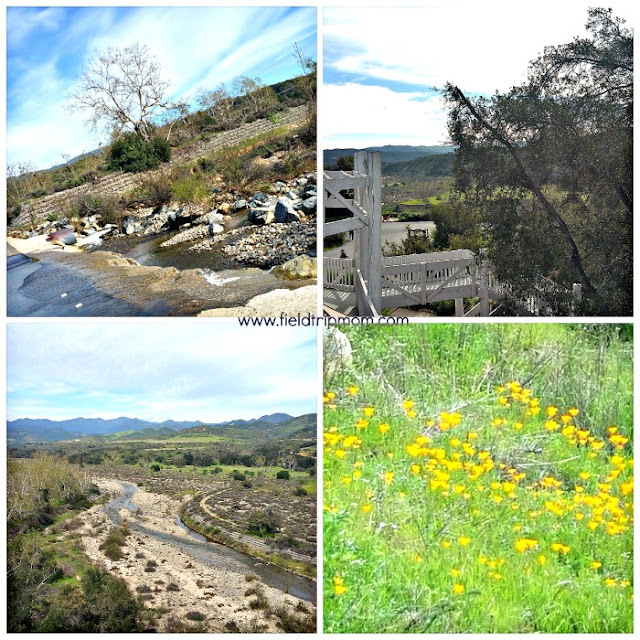 Caspers Wilderness Park an 8,000 acre park great for a family field trip. The park offers family events, ranger led hikes and educational programs. 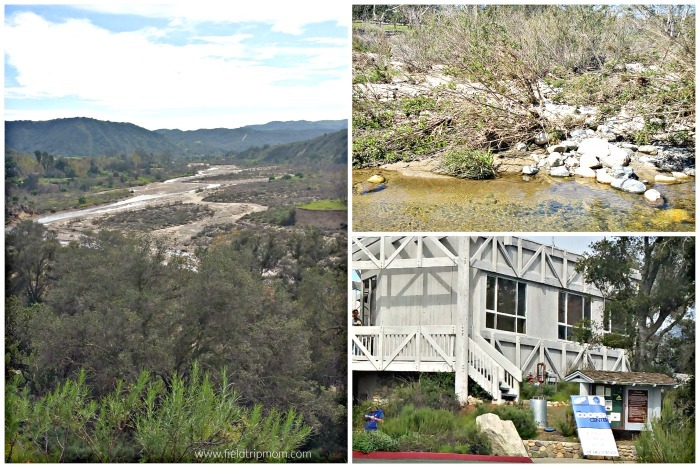 For wilderness fans there is a nature center that is filled with lots of hands-on exhibits. On most weekends you will find bird watchers, hikers and nature groups enjoying the beautiful landscapes. Interpretive Center: Open Saturday & Sundays only, 9 a.m. to 3 p.m.
Check-in time 2 p.m. and check-out time 12 p.m.
Day Use - 7 a.m. to sunset all year. $5 Saturday - Sunday; Higher for some holidays and events.